Perennials are great additions to your home garden. Peonies are among the prettiest and easiest to maintain of all the perennials you might choose. Peonies are favored for their large, fragrant, showy spring flowers. Once established, the plants are easy to grow and can last in the flower garden for many years with just a minimum of care. They do well in the home landscape when planted in front of evergreen shrubs (such as the hollies, boxwoods, or members of the juniper family), their larger-leafed, open-growing nature contrasting nicely with the smaller leafed, more densely formed evergreens. Full sun is needed for the best and fullest blooms on peonies, although they will tolerate partial shade, their dark green leaves making a striking appearance even in the absence of blooms. As for soil conditions, well-drained soil that is rich in organic matter is favored by the peony roots for establishment and long life. A deep, well-dug planting area should be prepared for the roots, which can be set into the ground any time from August until frost or freezing has begun. The tops of the roots should be no more than 3 to 4 inches below the surface of the ground; if planted too deeply, the peony may not produce blooms. Once the roots become established and spring growing conditions become favorable, the reddish-purple shoots will push through the ground and top growth of the peony will occur surprisingly fast as the plant is transformed into a lustrous showy little bush with lots of spread. As the stems push upward and become heavy from their own weight and from the weight of the spherical bloom buds that will soon become large blossoms (3 to 5 inches wide), the peony bush will tend to collapse outward. 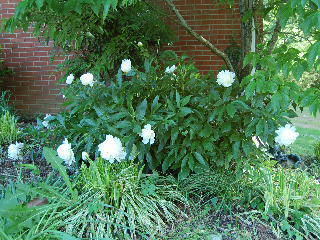 Before this time is reached, some form of support should be put into place to assure that the peony will be able to maintain its upright bushy appearance, and that the big showy blossoms will not fall over onto the ground. Wire cages similar to the ones used to support tomato plants are useful for this purpose. The cages should be put into place in the spring while the plants are still small and, certainly before they get so big that the peony branches would be damaged by trying to crowd them into the support cages. The plants do not need to be tied to the cages (as tomato plants often need to be), but will support themselves against the inside of the cages due to their own fullness of growth. 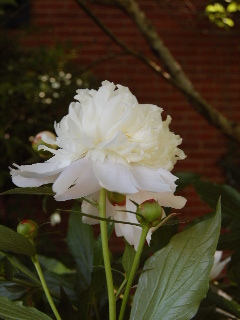 Over a period of years, the peony stems may become too crowded and the blooms may become small. If this starts to occur, it may be time to rejuvenate the plant by root division, dividing the root clump into several smaller clumps and replanting them in rich loose soil. This should be done in the fall as the tops are dying down. Dig up the roots, allow them to dry for a couple of hours, and then cut them into sections using a sharp knife. Each root section should contain at least 3 to 4 “eyes” to allow for fullness of growth on the new plants. Peonies are available in a variety of colors from white to red, with many shades in between such as the soft rose-white or sometimes a salmon pink coloration. The large colorful blooms provide a striking show in your garden, or they can be cut and brought into the house to use in bouquets and tabletop flower arrangements. For ease of care from year to year, the pretty peony is the perfect pick from a plethora of perennials!